April-ish 2015. The fourth Tax Justice Research Bulletin is out (a monthly series dedicated to tracking the latest developments in policy-relevant research on national and international taxation). Find it all together, as it should be, at its TJN home. This issue looks at some striking results from the US on the employment impact of cutting taxes for the top 10%; and at ‘inefficient and unjust’ Greek tax policy since 1995. The Spotlight looks at the literature on base erosion and profit shifting by multinational companies, drawing on a handy study from the OECD BEPS 11 people, and a new Banque de France working paper. This month’s backing track probably refers more to Greek policymakers than the CTPA: the late, great Lucky Dube’s Mr Taxman (“What have you done for me lately?”). For your future research needs, the updating of the ICTD Government Revenue Dataset is almost complete, so with a bit of luck it will be published in June. Discussions about a major 2016 conference and call for papers using the data are underway. As ever, submissions for the Bulletin – substantial and musical – are most welcome. The 4 Rs (or 5) of tax provide a simple basis for thinking about what effective taxation can deliver: not only revenues and redistribution, but also re-pricing of social goods and bads, rebalancing of an economy between sectors, and perhaps most importantly, supporting accountable political representation (in which the evidence indicates a critical role for direct taxation). 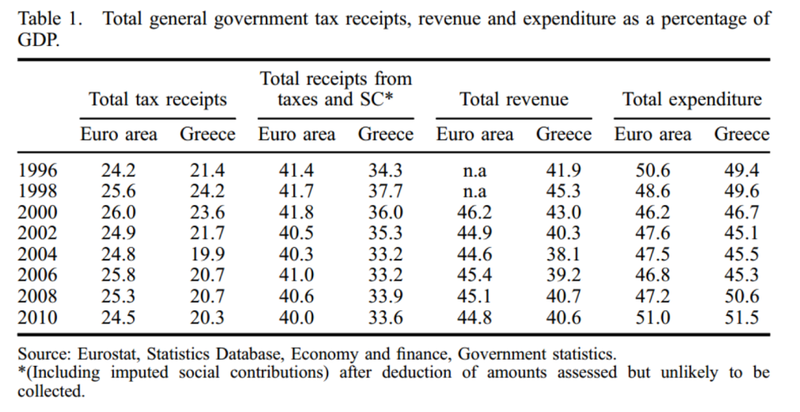 While popular analyses of Greece’s fiscal issues have tended to start and end with fiscal profligacy, a new (ungated) article by Yiorgos Ioannidis on ‘The political economy of the distributional character of the Greek taxation system (1995-2008)’ reveals that the problem is not high spending but weak revenue-raising; and that the underlying failure is one of representation as much as of revenues. The starting point for Ioannidis is the disconnect from the mid-1990s between buoyant economic performance and the failure to close the gap in tax performance with the rest of the Eurozone – seen clearly in table 1. The specific underlying failure, as Ioannidis reveals, relates to direct taxation. 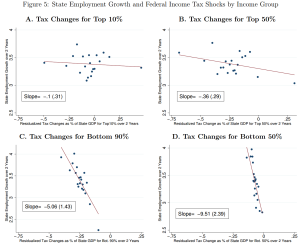 Ioannidis explores much of the detail on policy mistakes, including the decision to use growing formal employment to fund corporate tax cuts, and in respect of property taxation. Most striking is the analysis of decisions around income taxation that actively undermined compliance, along with vertical and horizontal equity, and resulted in a highly regressive structure. If tragedy is the right word, it is because it could have been foretold to the protagonist policymakers beforehand that these decisions would squander both the economic and political development opportunities that presented themselves in the 90s. The challenge for the new government is that rebuilding faith in public institutions, their fairness and representativeness, is necessarily a slow process. But while the need to raise greater revenues risks greater hardship on the way, it may ultimately support the virtuous cycle of better taxation and more accountable political representation. One role in this for Eurozone partners and other jurisdictions is to ensure the automatic provision of tax information that is necessary to curtail offshore tax evasion. March 2015. The third Tax Justice Research Bulletin is out, catch it in its full glory (with backing track suggested by Christian Hallum) on its TJN home. This issue looks at new papers on the responsibilities of tax professionals in respect of abusive tax behaviour and corruption; and on the parallels between the 1974 banking crisis and that of 2008, and policy lessons that emerge. The Spotlight considers contrasting views on tax and freedom. One thing to flag: a call for papers from UNU-WIDER, who are stepping up their interest in tax. The call is open until 30 April, and is part of WIDER’s new project on ‘The economics and politics of taxation and social protection’ which is also worth a look (includes call for research proposals and researcher vacancies). As ever, ideas for the Bulletin are most welcome – including suggested music. PS. Congratulations to tax lawyer @jolyonmaugham on formally becoming a QC this month – now so silky he could feature in Barcelona’s midfield. Tax Freedom Day began in the late 1940s in the United States, as a political marking of the day when the nation has in theory earned sufficient income to pay the total tax for the year – in other words, the same proportion of the year has passed, which is expected to be the proportion of taxes to GDP. It is now calculated, generally by quite right-wing organisations that see tax as a threat to democracy, in a handful of other countries. A fairly clear critique can be constructed on the basis that the national aggregation obscures more than it reveals. A different political story could be told, for example, by comparing the ‘tax freedom’ day of a median-income employee of a given company, with the ‘tax freedom’ day for the company itself. Or of that employee with the CEO? But the more substantive critique revolves around whether tax and freedom have any relationship. One of the more well-established results about aggregate taxation has been found between the proportion of public expenditure funded by tax, and the strength of democracy (notably Ross, 2004; and even more clearly by Prichard et al, 2014, with the new ICTD Government Revenue Dataset). So political freedom (if by that we understand the freedom facilitated by effective political representation) seems to increase with reliance on tax, compared to other revenue sources. What of economic freedom? A new paper from James Mahon sets out to examine just this question, using the ‘freedom’ measures created by the range of relatively right-wing organisations that have tended to support tax freedom day – notably the Fraser Institute, and also the Heritage Foundation. [T]he need to expand tax revenues in order to pay down debt, tends to keep governments attentive to what pleases investors and inspires the compliance of taxpayers – whether or not these mount colourful demonstrations against the ‘tyranny’ of big government. If you had to pick a single measure for the tax performance of a country, or a government, what would it be? That question now confronts the folks working on the post-2015 successor to the Millennium Development Goals (MDGs), as they seek an indicator for the global framework. In this post I look at a few contenders, and their strengths and weaknesses. Quick thoughts on the main contenders are below; but if you’re short on time, the table has a summary. And if you’re really short on time, the answer: for all its issues, the tax/GDP ratio is probably worth sticking with; while the tax/total revenues ratio is an important complement. One of many areas in which the framework is likely to improve upon the MDGs is the attention to tax. This includes a specific target on illicit financial flows, encompassing individual and corporate tax abuses inter alia. On these, I made three specific proposals for the Copenhagen Consensus. But the question that’s come up a few times this week is on the broader point of measuring tax system performance. How, in the period 2015-2030 (say), can we track the success or otherwise of tax systems? Tax people (yes you, @alexcobham), what’s the best single indicator of a country’s ability to collect taxes, tackle evasion, etc? Ten years ago I proposed the 4Rs of taxation, as a simple way to think of what a tax system can or should deliver. Richard Murphy has since added a fifth. To date, the focus has been almost entirely on revenue (‘domestic resource mobilisation’, in UN-speak). This makes sense, with one exception that I’ll come to. Redistribution will be treated elsewhere. To my excitement, the current draft includes 10.1: ‘Measure income inequality using the Palma ratio, pre- and post-social transfers/tax…’. Re-pricing (use of the tax system to make e.g. tobacco or carbon emissions more expensive) is less central, and the climate aspect also features elsewhere in the framework. Re-balancing the economy (e.g. addressing tax differentials to reduce the size of a too-big-to-be-efficient financial sector), Richard’s important addition, is also an option in a good tax system more than a definition thereof. Representation, however, is a vital outcome of a good tax system. It is the aggravation of paying tax, and above all direct taxes (on income, capital gains and profits), that build the citizen-state relationship as people are motivated to hold government to account for their spending decisions. The alternative dynamic is too often seen in resource-rich states where tax plays only a small role in overall spending, and may also result from situations of sustained, intense aid flows. 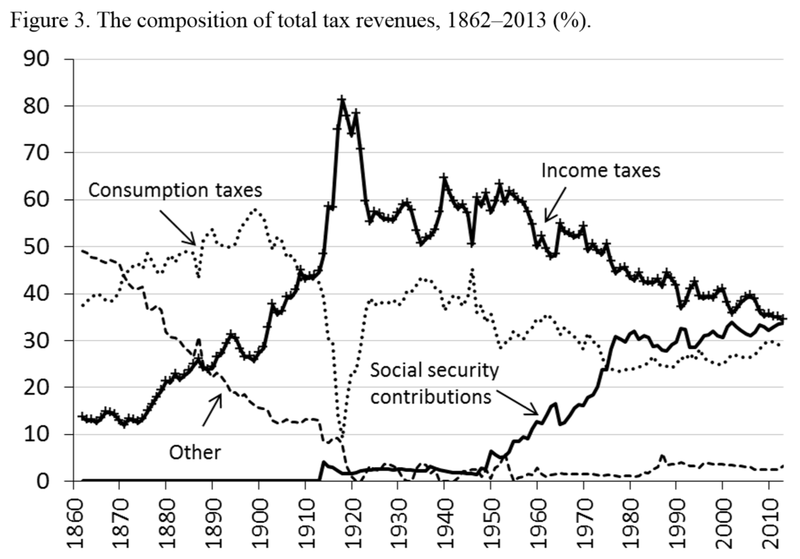 Various findings, most recently and powerfully a new analysis with the ICTD Government Revenue Dataset, confirm that the share of taxation in total government revenue is an important determinant of the emergence of effective democratic representation. So we should consider representation as the other core feature of tax, alongside revenues, when we look for broad measures of progress. What ratio of tax receipts should we use for inter-temporal and/or cross-country comparisons of tax performance? I propose three criteria. Ideally we would have a ratio where the denominator is in the control of policymakers; where the denominator (as well as the numerator) is well measured; and where the ratio is demonstrably meaningful as a measure of performance of the tax system. 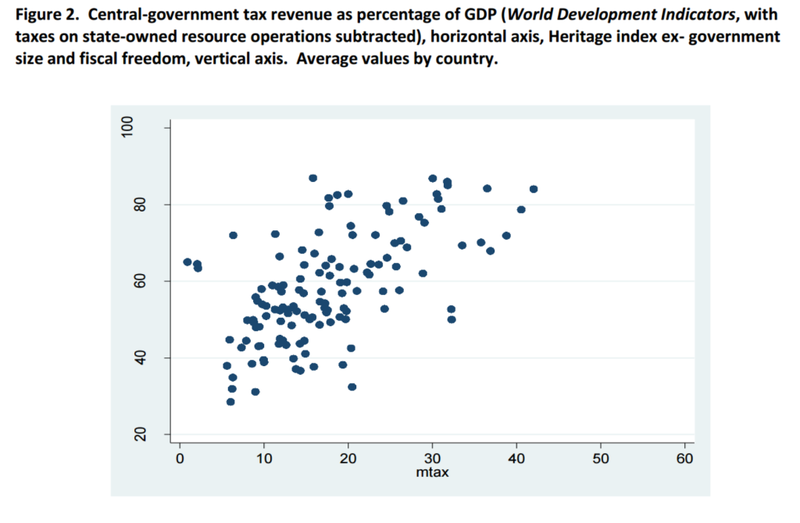 The most commonly used measure is the ratio of tax revenues to GDP. Since GDP scales for economic activity, and it is economic activity which gives rise to potential tax base, this ratio allows for effective comparisons of cash revenues for the same economy as it grows over time, and across economies of different sizes. Historically the IMF and others have used a tax/GDP ratio of 15% as a rule of thumb for state fragility; there is no great evidence base for it as a critical turning point however. There are two main weaknesses to the tax/GDP ratio. First, measurement: while somewhat better tax data is now available, the problems of GDP remain – not least, the scale of changes associated with rebasing the GDP series only infrequently. 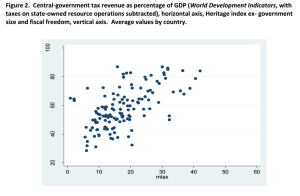 As we noted in the paper introducing the new ICTD Government Revenue Dataset, careless use of GDP series can result in apparent tax/GDP ratios in excess of 100%; and more generally, creates major inconsistencies. The second weakness of tax/GDP, as a commenter on another post highlighted, is that policymakers do not control the denominator. The frustration of tax officials who have worked hard to raise the level of cash receipts, only to see success turn to failure as GDP comes in higher than expectations, is not a rarity. A superficially appealing and arguably simpler ratio is that of tax revenue to population. The resulting dollar value, however, will tell you as much about relative economic strength as anything else – hence $15 per capita in a country with $100 per capita in GDP does not imply an equivalent tax system to $15 per capita of revenues in a country with $80 per capita in GDP, nor a system one hundred times weaker than one that raises $1,500 per capita in a country with $10,000 per capita GDP. Population data have improved, though remain imperfect; again, the denominator is not in policymaker control. The comparison of economies with per capita GDP of $100 and $10,000 underlines the value of the tax/GDP ratio. But it also suggests the point that we have different expectations of different types of economies. Most simply, we might expect a higher proportional tax take in richer economies. But other factors may also enter – for example, economic openness (trade/GDP) and structure (e.g. 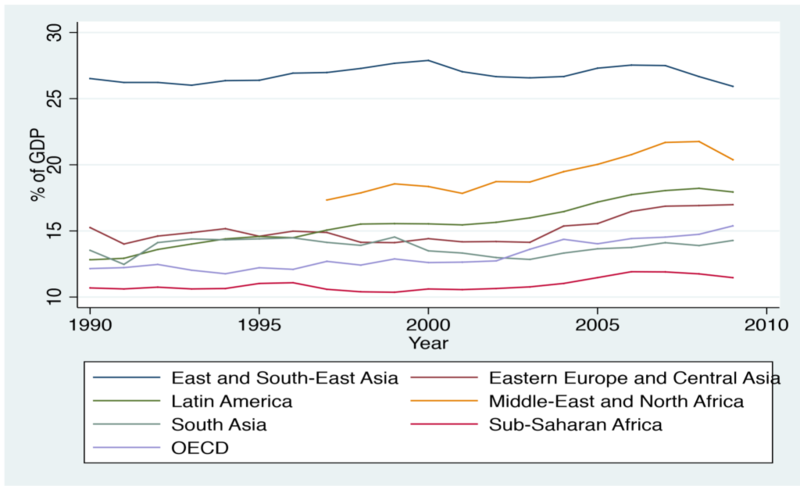 share of agriculture in GDP), or, say, population growth and governance indicators. Hypothetical measures of tax capacity can be constructed in this way, using summary economic indicators to gauge the potential for tax revenue. Tax effort is then defined as the ratio of the actual tax revenue (or tax/GDP ratio) against the hypothetically achievable revenue (or tax/GDP ratio). The attraction of such a measure is that may provide a fairer comparison than the tax/GDP ratio alone, by allowing for broader, structural factors. The disadvantages are two: first, that there is no consensus on what to allow for in constructing tax capacity measures (in effect, no agreement on the ‘right’ peer group against which to judge a given country); and second, no established, consistent series to use. Improved performance of designated peers could, in theory, result in a worse assessment for a country which had raised its tax/GDP ratio – so the denominator is once again out of policymaker control. Finally, an indicator that does not provide a comparison on revenue terms but rather on tax reliance: the ratio of tax to total revenue. Since this ratio appears to be associated with improved governance, or more effective political representation, there is a good case for its inclusion in addition to – rather than instead of – one of the above. Measurement presents no additional problems (if tax data is present and of acceptable quality, then so should total revenue be); and the denominator is in policy control to a similar extent to the numerator. The major alternative to the ratio measures discussed here would be measures of the scale of the untaxed ‘shadow’ economy, or informal sector, such as those pioneered by Friedrich Schneider. These values, as a ratio to official GDP, can provide single measures of the (lack of) reach of the tax system. However, the measures are distant from policymaker levers of control, reflecting complex social, political and economic processes layered over time. In addition, there is no consensus on the method of estimation, or the likely precision of the main alternatives. Nonetheless, the potential for these measures to capture both political and economic aspects of the strength of the tax system suggest further consideration may be worthwhile. To recap: what’s the right tax target for post-2015? Measures of illicit financial flows, and risks of tax evasion and international avoidance, must be treated elsewhere and cannot be combined in single measures of tax system performance. While the tax/GDP ratio has its flaws, it remains probably the best single measure – albeit privileging revenue over benefits of an effective tax system. The most important other benefit, of improved state-citizen relations and political representation, provides the basis to include tax/total revenue as an additional indicator. Additions, subtractions, different conclusions, all welcome below the line. 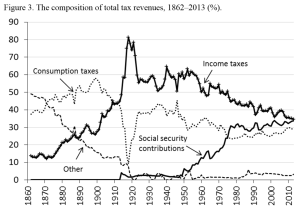 150 years of tax data! Republished from the Tax Justice Research Bulletin – find it all there, with added blues. Sweden’s IFN (the Research Institute of Industrial Economics) has undertaken a fascinating project, to bring together and to analyse what seems to be the longest single-country span of tax data ever compiled. Published this month is the overview paper, by IFN researchers Magnus Henrekson and Mikael Stenkula. There’s a wealth of insight in it, and the individual papers that it draws upon, so I’ll just pick out a couple of points here. First, the Swedish system has seen major swings over time in both structure and scale . 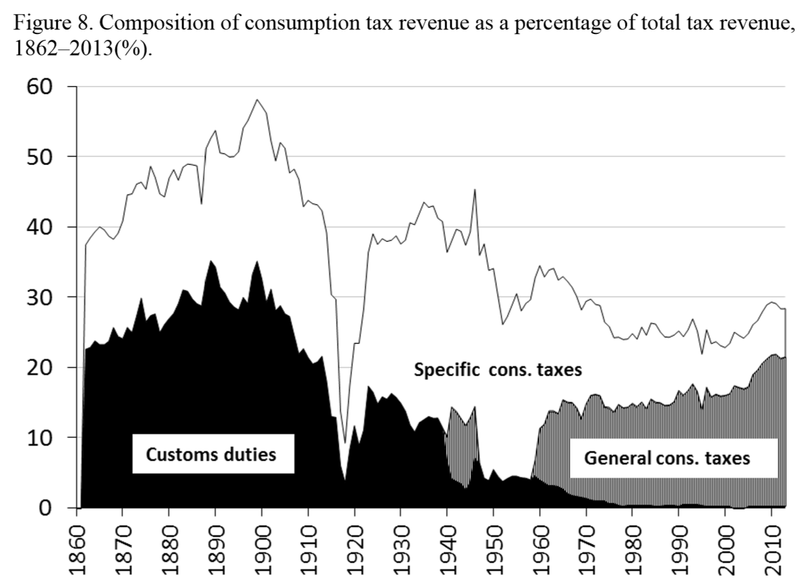 The authors identify three major stages: a low and stable tax-to-GDP ratio until around 1930, with consumption taxation the major component; sharply increasing tax-to-GDP to around 50% and then stable until 1990, with income taxes important, and VAT and social security contributions increasingly so; and then a declining tax-to-GDP ratio post the 1990–1991 reforms, with income taxes decreasing, wealth and inheritance and gift taxation abolished, and a growing relative reliance on consumption tax and social security contributions. The second broad point that emerges very clearly is that the type of tax headings I’ve just used are not always helpful, especially in long-term analysis. The consumption tax revenue pattern in figure 3 conceals the same shift seen in most developing countries, albeit compressed into the last few decades, of customs duties being less than fully replaced by general consumption taxes (with possible though uncertain regressive impact). In Sweden’s case, there has also been a major reduction in revenues from ‘specific’ consumption taxes (sin and luxury taxes in particular). Two areas in which the research could be usefully extended are to consider the associated developments in inequality (see Spotlight below), and in political representation. The latter is a slightly odd omission, where the authors motivate the work by setting out the other four of the five Rs of taxation. But this is quibbling, of course. The paper, and the project, represent exactly the type of work that, as Morten Jerven has pointed out, is necessary to complement the improvement in cross-country data represented by the ICTD’s Government Revenue Dataset. It would be valuable for the authors to share further details on the process and resource demands of the project, as an input to others considering the same in other countries.